A FAVORITE SERIES CHARACTER FINDS HERSELF IN HARM'S WAY. 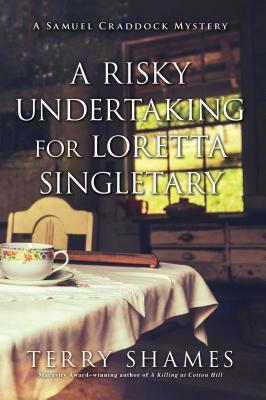 After using an online dating site for senior citizens, town favorite Loretta Singletary--maker of cinnamon rolls and arbiter of town gossip--goes missing. Chief Samuel Craddock's old friend Loretta Singletary--a mainstay of the Jarrett Creek community--has undergone a transformation, with a new hairstyle and modern clothes. He thinks nothing of it until she disappears. Only then does he find out she has been meeting men through an online dating site for small-town participants. When a woman in the neighboring town of Bobtail turns up dead after meeting someone through the same dating site, Craddock becomes alarmed. Will Craddock be able to find Loretta before she suffers the same fate? Finding out what happened to Loretta forces him to investigate an online world he is unfamiliar with, and one which brings more than a few surprises. Terry Shames is the author of the Samuel Craddock mysteries A Killing at Cotton Hill, The Last Death of Jack Harbin, Dead Broke in Jarrett Creek, A Deadly Affair at Bobtail Ridge, The Necessary Murder of Nonie Blake, An Unsettling Crime for Samuel Craddock, and A Reckoning in the Back Country. She is a member of the Mystery Writers of America and Sisters in Crime. “There may be no protagonist in our genre today as decently compelling as Samuel Craddock.